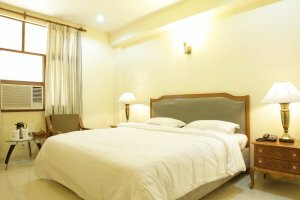 Angel Residency is Greater Noida's premiere hospitality services company, dedicated to perfecting the experience of our guests through continuous innovation and high standards of hospitality. Situated at a very close proximity to the India Expo Mart (1-2 minutes drive), we are currently being preferred by companies like LG, Honda Siel Cars, Samsung, Moserbaer, India Expo Centre etc. 1)Complimentary In-room Tea/Coffee making facility. 4)Doctor on call 24 hrs. 6) Round the clock transport facility. 8) Calling Cards available for long-distance calls. 9) 24 Hrs running hot & cold water. 10) 24 Hrs Power Backup. 11) Laundry & Dry cleaning service. 12) Major Credit Cards Accepted. 13) Airport transfers on a chargeable basis.